Online collaborative platforms connect geographically-dispersed researchers to enable them to cooperate seamlessly on their research, sharing research objects as well and ideas and experiences. Collaborative platforms are usually online services that provide a virtual environment to which multiple people can concurrently connect and work on the same task. These can range from extensive virtual research environments (VREs) which encompass a host of tools to facilitate sharing and collaboration, including web forums and wikis, collaborative document hosting, and discipline-specific tools such as data analysis or visualisation, right down to single specific tools which enable researchers to work together in real time on specific aspects of research (such as writing or analysis). Research collaboration is growing exponentially and teams are becoming ever more interdisciplinary as researchers increasingly work in international and cross-disciplinary consortia to enable a multitude of perspectives on specific research questions. Fostering national and international collaborative research is increasingly a funder priority. It lies, for example, at the heart of EC Research Commissioner Carlos Moedas’ strategy, i.e., "Open Science, open innovation, open to the world". Virtual Research Environments (VRE) and collaborative platforms enable collaboration across continents, time zones and disciplines. In this module you will develop an understanding of collaborative platforms that work today, and how they can greatly enhance your research workflows. Learn what major types of collaborative platforms are available and what the use cases for each might be. Learn the advantages of such systems. Identify any possible shortcomings of collaborating via such platforms and how to overcome them. Virtual research environments have been defined as "innovative, dynamic, and ubiquitous research supporting environments where scattered scientists can seamlessly access data, software, and processing resources managed by diverse systems in separate administration domains through their browser" (Candela, Castelli and Pagano, 2013). Some libraries already offer personalised VREs for specific projects. For example, Leiden University library offers VREs for all externally-funded projects of more than five persons. An especially important collaborative platform in the context of Open Science is the Open Science Framework (OSF). Based on open source technologies and created by the not-for-profit Center for Open Science, the OSF brands itself as "a scholarly commons to connect the entire research cycle". 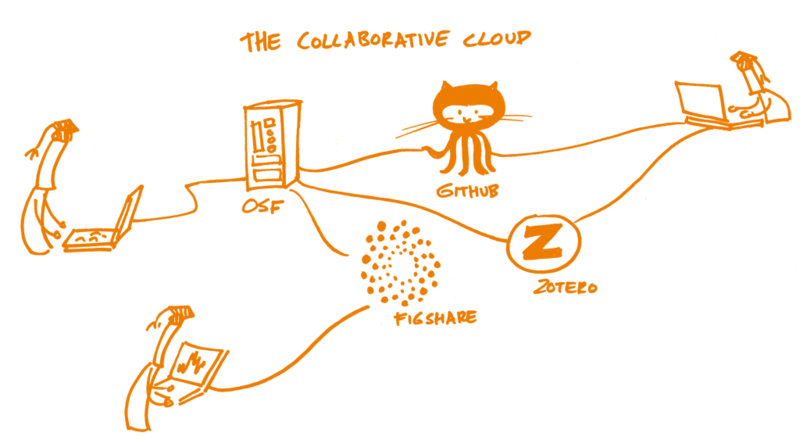 The OSF enables researchers to work on projects privately with a limited number of collaborators and make any part or the whole of their project public. It connects directly with many other collaborative systems like dropbox, GitHub and Google Docs, and can be used to store and archive research data, protocols, and materials. Especially in the currently-predominant "publish or perish" culture of research, writing is a core task in the life of researchers. Several online tools and platforms now enable researchers to work together on documents in real-time, and so avoid the versioning-hell of emailing Word documents back and forth. Platforms include Overleaf, Authorea, Fidus Writer, ShareLaTeX and Google Docs. Note that many of these tools are based on proprietary technologies and some require payment for advanced features. There are plenty of tools which enable groups to store and manage references. Examples include Zotero, Citavi and CiteUlike. Mendeley incorporates a sharable reference manager, as well as a social network and article visualization tools. Relatedly, BibSonomy allows researchers to share bookmarks and lists of literature. The power of the Web enables new modes of post-publication collaborative review through services like PubPeer and Academic Karma, as well as annotation tools like Hypothes.is and PaperHive. Researchers have long made use of the Web for social networking - either via mainstream social networks like Twitter, Facebook and Linkedin or dedicated academic social networks like ResearchGate, Academia.edu and Loop. Q: "Why should I add another layer of complexity to my collaboration process? Sharing the doc file is sufficient!" A: This is incorrect; although it may seem that you are introducing additional tools and platforms into your usual working approach, they are actually resolving communication issues that you were probably not aware of in the first place. For example, using just a doc file (with or without track changes), only shows the higher level of information and usually only at the tail of the entire scientific process. Working in the context of a collaborative environment, from design to reporting, establishes both clear communication and adequate provenance. The researcher will become familiar with the range of options available to aid greater collaborative research. After deciding what works optimally for their workflow, the researcher will be able to use collaborative tools such as GitHub and the Open Science Framework for increased collaboration for the research process, writing/authoring, and sharing your research outputs. The researcher will be able to collaborate with colleagues to write documents collaboratively, annotate articles and share this discussion.